HART is raising funds for an exciting new project! 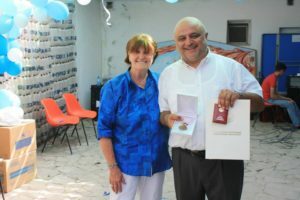 HART needs your support to help us introduce disability rehabilitation to Myanmar, drawing on the training and expertise of one of our most trusted partners, Vardan Tadevosyan, Director of The Lady Cox Rehabilitation Centre in Nagorno-Karabakh. This project will enable Vardan to travel to Myanmar in order to assess facilities and health workers before initiating training with two of his therapists from Nagorno-Karabakh. In Myanmar, the project will be coordinated by another of HARTs longest-standing partners, Dr. Sasa, founder of Health and Hope. In Myanmar we hope to replicate the success of Vardan’s programme, recognising his unique experience in transforming a society’s understanding of disability rehabilitation. The project will identify people with disabilities; train staff in rehabilitation; provide quality treatment and equipment and advocate for disability care in order to eliminate stigma against the disabled and ultimately improve the quality and accessibility of care available to the disabled in Myanmar. Additionally, the project will provide an opportunity to increase recognition of Nagorno-Karabakh and hopefully begin to build international support for the region. Vardan is a highly qualified trainer in rehabilitation and has direct prior experience in achieving this project’s objectives. 2018 marks the 20th anniversary of Vardan’s centre in Nagorno-Karabakh, one that has been internationally recognised as a centre of excellence and provides care for 1,600 people every year. Vardan holds invaluable experience in establishing rehabilitation in places that lack the knowledge, support and understanding of how to help the disabled, as was Nagorno-Karabakh 20 years ago and Myanmar is today. HART support three inspirational projects in eastern and western Myanmar, where access to medical care is seriously lacking, and virtually non-existent for disabled people. Dr. Sasa, founder of Health and Hope, is the first and only qualified medical doctor in Chin State, Western Myanmar, after completing his studies in Armenia. Over the past 9 years, Dr. Sasa has trained over 1,000 Community Health Workers, which save 8 out of 10 people who would previously have died due to a total lack of health care in the State. Dr. Sasa will be the in-country coordinator for this project with the ability to mobilise a large number of health workers. We also seek to include our other trusted partners in Myanmar, Shan Women’s Action Network and Doh Say, who are both committed to increasing access to health care in remote areas of Myanmar. Can you help us make this unique opportunity a reality? This project has the potential to change the lives of thousands of disabled people in Myanmar. To get it started, HART is trying to raise £27,500. These funds will enable Vardan to travel to Myanmar twice, and Sasa’s remote health workers to travel to a central meeting place, along with other relevant individuals. Visit 1: Vardan, with HART staff, to assess facilities, engage with in-country teams, and ensure correct processes and support is in place. Visit 2: Vardan and two therapists, with HART staff, to initiate training with key health workers. In these early stages, it is crucial for individual support to get the momentum going. Any amount you can give to support this project will be hugely appreciated. By Card: Use a debit/credit card or your PayPal account below, ensuring the appeal reference is CHARM. If you aren’t able to use PayPal, please see our GoFundMe page here. By Bank Transfer: Contact us at office@hart-uk.org and we will send you our bank details to make a direct transaction.